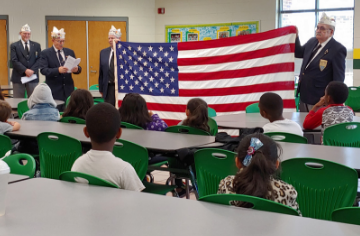 A group of local veterans gave a presentation on the U.S. flag to the first grade students of Wilson's Mills Elementary. The students were taught about who made the flag, what the stars and stripes represent, how to properly care for the flag, and much more. Each student also received their very own flag. 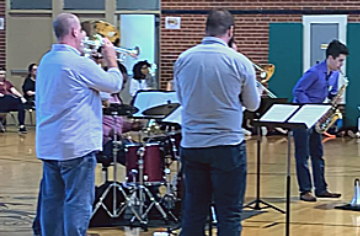 The students of Wilson's Mills Elementary learned about various brass and woodwind instruments as they were treated to a performance by Hot Horns. They demonstrated and explained about the tuba, trombone, trumpet, saxophone, flute, and more. 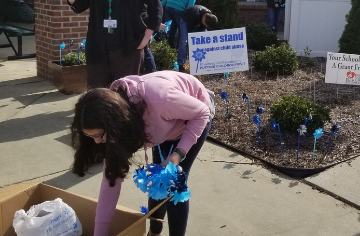 Teacher Assistants and Student Government of Wilson's Mills Elementary spearheaded a campaign to raise funds for child abuse awareness and autism awareness. A total of $561 was raised and checks of $280.50 were presented to both the Harbor House and Autism Society of North Carolina. On April 1, 2019 a pinwheel garden was planted for Pinwheels for Prevention. April is Prevent Child Abuse Month and Autism Awareness Month. 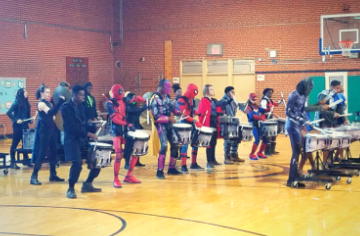 The SSS band, which included some Wilson's Mills Elementary alumni, put on a performance for 2nd-5th grade students. They dazzled with their skillful instrumental play, bright costumes, and athletic acrobatic displays. Do you want to be more involved? Join us for our monthly PTA Board Meetings. Dates are located on our Calendar.